A 700 ml. 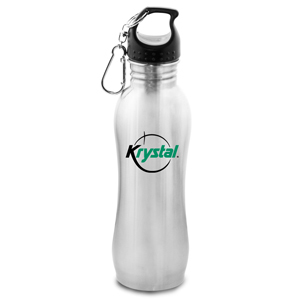 polished stainless steel water bottle with a screw on lid featuring an attached carabiner. Easily fits into most car cup holders. This item can be laser engraved for an additional charge of $0.50 (G) per unit. Individually packaged in a white box. SKU:S-703. Categories: Drinkware, Promotional Merchandise.